Sister-to-Sister Summit on Saturday, November 19! 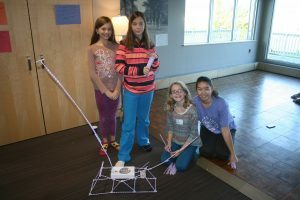 The widely successful “Sister-to-Sister” Program is gearing up for its twelfth season of mentoring middle school girls. Since 2005, Middlebury students have invited girls from the three middle schools in Addison County – Middlebury, Vergennes, and Bristol – to participate in monthly two-hour events on campus and a one-day summit in November. At events, one “fun” activity is usually paired with a discussion. When sisters meet at the pool for log rolling, for example, they will get together after splashing in the water to discuss conceptions of body image. In general, “Sister-to-Sister” strives to make a positive difference by giving a voice to the needs and interests of middle school girls. The program provides a safe space to talk about the challenges that girls face in this day and age. It enables girls to develop friendships with other girls, even if they don’t go to the same school. The program recognizes that in addition to teachers and textbooks, achievement is affected by what happens in the hallways, between classes, and outside of school. Our big summit is scheduled for Saturday, November 19 from 9:30 a.m. to 4 p.m. at Kirk Alumni Center. Activities will include fun workshops such as improv theater, acapella singing, dancing, yoga, and cup cake decorating. All events are free and include breakfast, lunch and snacks (gluten-free, vegetarian options available). To register or organize transportation, please call Karin Hanta at 443-5937 or email khanta@middlebury.edu. Transportation requests need to be submitted by Wednesday, November 16.